Danny Hultzen started the Southern League All-Star game today, going one hitless inning in his final appearance in a Jackson Generals uniform. After the game, Ryan Divish reported that the M’s will promote the left-hander and SS Nick Franklin to Tacoma tomorrow or Thursday. Neither move was a surprise, as many observers have speculated that the M’s would promote two or three players after the All-Star game. Hultzen in particular was simply overpowering AA, striking out over 27% of the batters he faced and overcoming early wildness to become nearly untouchable in June: in his last 18 2/3 innings, he’s K’d 18, walked 5 and given up no runs on 8 hits. I was worried about platoon splits given his delivery, but at this point, his FIP’s under 3 against both lefties and righties. He can’t work on anything until he faces some better hitters, and now he’ll get to face more advanced opponents in some, uh, surreal environments. Looks like he may make his debut in Colorado Springs which seems like punishment, but hey, a promotion’s a promotion. Nick Franklin ended the first half of his age 21 season hitting .323 with a career high ISO, and a wOBA over .400, all while playing shortstop. He’d earned the promotion, but now the M’s will have some tough decisions to make on the various rosters. Carlos Triunfel could split time with Franklin at 2B and SS, or Triunfel could move to 3B, where Vinnie Catricala’s defense has been spotty. Catricala could move to LF, but that’s where the Rainiers have Alex Liddi at the moment. Realistically, though, this is only a real problem until the M’s make room on the 25-man active roster by releasing Figgins. At that point, Liddi can return to Seattle (assuming they don’t want to take a look at the struggling Triunfel or Catricala), allowing Franklin and Triunfel to play on the left side of the IF, with occasional games at 2B and Catricala could split time in LF/3B. I saw the news about these promotions at Cheney Stadium where the D-Backs top pitching prospect, Trevor Bauer, faced the Rainiers for the first time. I’m somewhat shocked he pitched given the Diamondbacks obvious reluctance to expose him to AAA video-game ballparks (like their own in Reno) and given the fact that there’ve been whispers about an impending call-up to the big leagues since late last season. In any event, I’m glad I got the chance to see him, and it’s going to be great to compare him to Hultzen once Hultzen finally makes his Cheney Stadium debut. Everyone’s been discussing, comparing, analyzing Hultzen and Bauer since May of last year, and they’ve both been better than advertised in pro ball. The thing about Trevor Bauer is there’s no easy way to summarize him. He’s unique. He has more sliders than many pitchers have pitches. Whereas many coaches tell their hurlers to limit their offerings and “master’ three pitches, the cerebral Bauer is constantly tweaking things and breaking out new pitches from time to time. He claims to throw 9 pitches, which would be completely absurd under normal circumstances, but seems tame after you watch his elaborate pre-game warm-up ritual. Unfolding over a leisurely hour or so, Bauer stretches his arm, elbow and shoulder using a variety of props from a heavy ball to rubber bands to a bendy pole. It’s only after 30 minutes or so of this that Bauer first picks up a baseball. Throwing slowly and deliberately, he plays catch, retreating gradually until he’s in deep CF while his partner’s on the foul line in deep RF. Then, he follows the wall from CF all the way to the LF foul line, still making looping throws to his partner. As you can imagine, the other player needs a cut-off man around the time Bauer gets to deep left center. There’s long-toss and then there’s…whatever this hybrid Japanese tea ceremony, Ripley’s Believe it or Not and Ichiro-gunning-out-Terrence-Long is. The pace and the strange, mannered way Bauer starts off keeps it from being obviously incredible for far too long, until the unreal nature of what you’re looking at slowly dawns: that small person is throwing a ball several hundred feet, again and again. Ok, I should probably talk about his game. On this night, Bauer sat between 92-95 with his fastball, touching 96. Despite his small size, Bauer gets a lot of velocity (and break) through a fluid but lengthy delivery. All his work on flexibility is required as his delivery gets an insane amount of rotation from his hips and trunk, and then his elbow and arm. He threw several sliders that I couldn’t reliably distinguish (including one that looked like a ‘reverse slider’/screwball), a change-up and a big slow curve ball at 75-78. Bauer simply couldn’t command his pitches on the night, especially his fastball. He’d miss up with a few, then bury a few more in the dirt. Then it’d be OK for a while, and then he’d hang one. It wasn’t just the number of balls he threw, it was just that he couldn’t hit his spots. The sliders weren’t a whole lot better, and so his most reliable pitch was his curve ball. His change-up looked promising, but with few lefties in the line-up, he didn’t throw a whole lot of them. He worked out of trouble in the first after walking Alex Liddi and Carlos Peguero (no easy feat, that), and had three walks through two innings. In the third, Liddi and Peguero hit back to back HRs to RF – Liddi’s a fly ball that carried just over the wall near the corner, and Peguero’s the sort of shot that the phrase “moon shot” was invented for. All told, Bauer went 5 innings, throwing 105 pitches to get 7 Ks, 4 BBs, 5 H, 2 R on the solo HRs. The stuff is definitely there, but the consistency and command clearly wasn’t, at least tonight. We’ll see what the DBacks want to do; Bauer seemed like the next call-up, but command problems might delay his arrival slightly. Daniel Hudson took a beating tonight from the likes of Brendan Ryan (?? ), so he may not be fully recovered from his shoulder issue. In any event, Bauer’s definitely someone to keep an eye on, and if you have MLB.TV (or, for however long he’s in Reno, MiLB.tv), worth making an effort to watch. My assumption is that Hultzen’s far more polished at this point, but may not match Bauer on pure swing-and-miss stuff. We’ll see soon enough. I should point out that this was my first time checking out Andrew Carraway in person – the righty has his own quirky delivery, and kept hitters off balance most of the night despite a fastball that sat 86-88. He worked both sides of the plate and constantly alternated FBs with arm-side and glove-side run, mixing in a slow change-up, and slurve. He clearly gets the most out of his physical skills, because he had guys like Geoff Blum and Stephen Drew hitting infield pop-ups and staring at strike-three fastballs all night. But it’s harder to think of guys who’ve succeeded in the majors with this arsenal, though I suppose Tom Milone er, no, Milone’s lefty…how about Colby Lewis? Yes, the new, 87-89mph version of Colby Lewis is giving hope to a legion of soft-tossing righties in the minors. 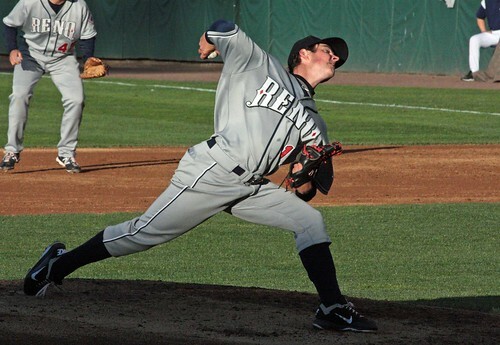 I know all pitchers look something similar in the process of throwing the ball, but does that ever look freakish. As in how does any pitcher not injure their elbow ligaments? So Liddi hit an opposite field HR ? Milone is a lefty. Bronson Arroyo would work for a righty. Enjoyed the Bauer scouting report/photos/etc. Great to see Hultzen finally get the call to Tacoma, but the more interesting move is Franklin. Do you see that having a ripple effect in the system? Perhaps Miller to Jackson? If so, any of the younger SS in the system moving up to High Desert? And here’s the crazy thing about Bauer’s pre-game warm-ups: Marc could have written another few paragraphs about it. It was so strange. For example, after completing the long-toss routine, Bauer removed his left shoe. Tugged and pulled on the sock. Then slowly slid his foot back in then went through this meticulous method of retying the shoe. Then did the same with the right foot. Maybe this isn’t so weird, but everything Bauer did had everyone just shaking their heads in amazement. Before his warm-up pitches each inning, he would do one crow hop throw. Starting behind the mound, he’d hop atop the bump and throw with so much torque and whip. The D-Backs must hold their breath every time he does it. Anyway, interesting night in Tacoma. Nice to meet you, Marc. Thanks, Marc, for this very enjoyable read. Much as I want to see Hultzen, I *really* want to see Bauer now. Part of this playing time equation should be simple: The Rainiers should play Nick Franklin every day. He’s the best hitting prospect in the system and he needs to be on the field. Franklin’s got a shot to start the year on the ML roster next year. He needs to play every day. He should not lose playing time to lesser players like Triunfel and Catricala. Yeah, I’m now officially a Bauer fan. Thanks for that. I wish Iwakuma hadn’t exploded last night, now there is no way we’ll see him replace Noesi in the rotation. So we’ll be stuck with both Noesi and Erasmo for some time, or until Hultzen is too good for AAA. Who is playing first base for Tacoma? Is it Jimenez? It seems like he has the lowest ceiling of the players in question and we could move Liddi to first base some. That would leave us with Liddi at 1b/LF, Catricalla in LF/3b, Franklin at SS/2b, Truinfel at 3b/SS. I also am of the belief that Truinfel should be worked into the outfield slightly but I understand the desire to keep him in the infield for now. Yes, paracorto – Liddi drew a walk, then went opposite field for a HR against Trevor Bauer. Then struck out, but he’d proven his point. Jimenez played 1st for Tacoma last night. Figures we’ll see some combination of Jimenez, Liddi and Mike Carp there soon. I wish Iwakuma hadn’t exploded, but I’m wary of him. I really like his splitter, but I’m not enamored of his fastball. Hey Carson – it was great to meet you too. And you’re right, I was contemplating doing a separate post on his warm-up, but it’s just not M’s-related enough. Every single movement looked weird initially, but it was so thought out. Everything had a purpose. Thanks BR – went with Colby Lewis instead of Milone, the A’s version of the Out Whisperer. Also, the Bronson Arroyo comparison doesn’t exactly excite anyone. He has a bad case of gopherball-itis in his career. Didn’t he set the record last year? I think Carraway compares more to any Twins pitcher ever. Kind of a Kevin Slowey, Boof Bonser type of guy. I haven’t seen him so I could be way off base, that’s just the impression I have from what I’ve read. Well, to be fair, many of the Twins guys (Slowey in particular) have had gopheritis. Slowey’s out of a (major league) job because of it. Carraway *could* have those issues down the road, despite the fact that he’s doing well in AAA. Carraway’s career HR/9 is higher than Slowey’s or Arroyo’s. Now, Carraway played in High Desert which throws things off quite a bit, but Arroyo spent three years in the PCL, so it’s not as off as it might seem. Fair enough. Hopefully Carraway doesn’t have too much of an issue with it. I see him becoming a guy who is always 6th on the organizations starting pitching depth chart. He’ll get called up from time to time but never truly stake a claim to a spot. Maybe I’m underestimating him (it would be nice if I was), but that’s just what I see becoming of him. Also cool about Bauer: His Youtube channel http://www.youtube.com/user/BauerOutage. Not only does he post videos of him throwing, he also chats there with youtube users. Yes, I thought about linking to his youtube channel and his twitter feed. In between the random chitchat, he’s had great interactions with fans and posed some philosophical questions about pitching to the analytical community, and I think the back and forth has been great. Confirmed that Hultzen’s first start in AAA will come at Colorado Springs. Confirmed that his Tacoma debut will happen on this Thursday, June 28th! Let’s just forget the Colorado Springs unpleasantness occurred.